Are you looking for a nice apron for Thanksgiving or Christmas while you entertain? Rosh Hashanah is also just around the corner. If you have been a long time follower of Canadian Coupon Mom you know we have posted some great deals from Flirty Aprons. Here is another great Flirty Apron deal! They are only until supplies last. Hurry fast if would like to get a Sassy Black apron. They also make great gifts. I am very excited to share some great news! We have a new addition to our family. This has been something D and I have been talking about for awhile. We have seen a few before but passed them up as we were not sure we were ready for another just yet. So what did we add to our family? A beautiful kitten! Last week a lady I support at work decided to take a kitten off another lady in the buildings hands as her daughter was allergic to kittens. Only to find out that the ladies roommate does not like kittens and the first lady I support is allergic also to cats and birds. Then the talk started as where and what to do with this adorable black kitten. Question was who can take the kitten and give it a good home? I was nominated as the ladies I support know how much we care for our Marty. They ask me almost daily how he is and what he has been up to. This idea was one I thought I should think about over night. I figured D would be good with it but at the same time I wanted to just talk it over. My supervisor even suggest myself to adopt this kitty. By the end of the night, here I was bringing a new black 7 week old kitten with me for an hour drive home. I put her in a cat carrier but she lasted maybe 5 minutes into the trip before getting upset. I opened the cage and she hoped on my lap where she laid the whole ride home. She is very affectionate and loves to cuddle. She is also very playful which at times isn't what you want, like when you are trying to sleep. Over all I think we got a beautiful and affectionate kitty. Her name is Lily and she is pure black with about 10 white furs under her belly. Now for a few pictures of our new girl! Our Marty man is taking his new friend very well. Lily follows Marty around everywhere he goes and snuggles in when they sleep. They also play and eat together. The first night we were sort of afraid Lily wasn't going to adjust as she met Marty at 4 am and started to growl and put up her back, now they are great. I am very excited to announce the two winners of the Coleman Summer Prize packs! I can't rave enough about Coleman. We LOVE our Puddle Jumpers tons also! They have been the "It" summer item for us this year! The winning comments are......#136 Hunter's Mom and also #160 409cope!! Congratulations! The winners were chosen using Random.org to be fair for everyone who entered as this is a random program online. I have sent both winners an email with the information I will need from you for your prize pack. Please respond within 48hrs of the email. Thanks! Please check out the other giveaways going on right now on our Giveaway page! We will be adding more soon. Want a great way to put a smile on your kids face when they are at school? Why not send them with a hug, smile or a little note? 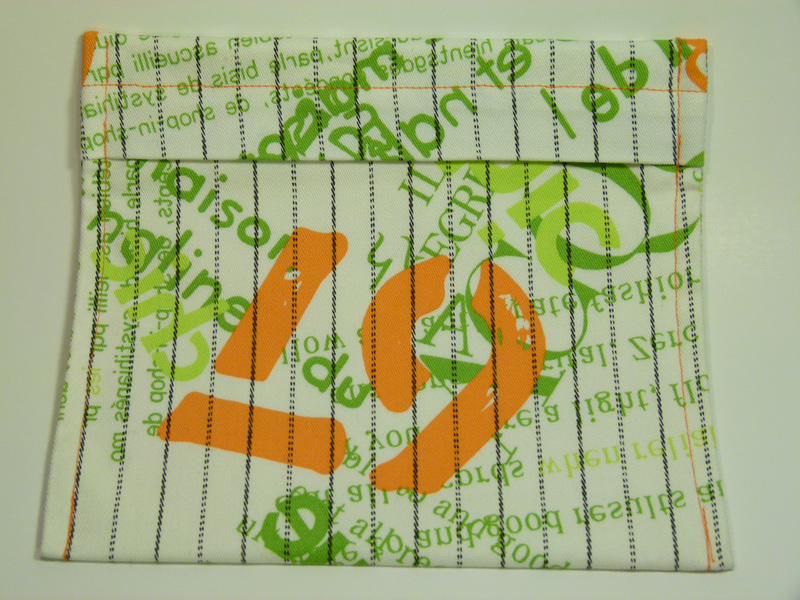 Little Jots makes it very easy to stay organized and send some love with your kids lunch bag! Little Jots is a Canadian company that helps inspire, connect and make children feel loved, valued and special. Maria is a proud mom and the Creator of Little Jots, a truly fun and unique way for parents to send carefully crafted pre-written notes or have the option to write their own personal messages to send to school with your kids. Maria wanted to help boost the parent-child connection and relay sentiments of love, inspiration and encouragement for children all over the place. "I began jotting down hundreds of messages that I thought our children should hear. Then it came time to choose the top 20. To ensure that the pre-written notes were just right, I spent many months researching, developing and refining these messages and consulted with child development specialists." says Maria. "Each one of them gave me tremendous feedback that helped me refine the notes even further". Buy It: Little Jots comes in a convenient hardcover book that holds the 20 pre-written notes, 20 blank notes, 28 "kiss" &amp;amp; 28 "Hug" stickers to close the notes, refill pockets and a pen. This retails for $14.95 and is available on Little Jots Website. Also available are refill packs for $6.95. Right now until October 1, receive free shipping. I am very excited to send these little notes with both of my kids this year. 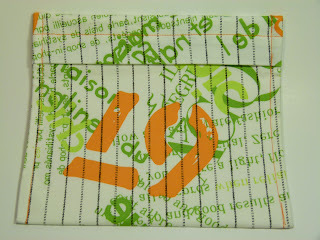 The Little Jots is very organized and will be easy to put in a quick note. I have it on my counter ready to be used for those special reminders to P and A. This will be a great way to have the young ones learn to read and feel very special with their notes. I love how the paper is a thick paper, doesn't feel like it would rip easy and the colors are great for a boy or girl. I love the idea! 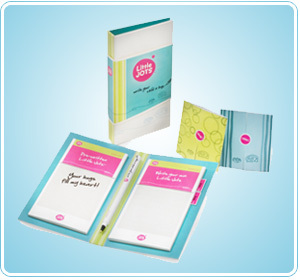 Win It: Our friends at Little Jots want to give one lucky Canadian Coupon Mom their own Little Jots for Back to School! In June my family and I took a nice weekend away at a cottage. The first real camping experience my children have had. This was also another fab find on a Daily Deals site. Two night stay during the week for $75 a value of $271! The catch? This coupon deal needed to be used in June and between Sunday to Thursday. Marble Lake Lodge is where we found a really good deal. If you haven't heard of Marble Lake Lodge, it is located in Cloyne, Ontario not too far from Bon Echo provincial park. It took us a couple hours to get there but it was a very nice drive. We booked Cottage #6. This cabin can have up to six people staying. It is a two bedroom with a kitchen/livingroom and a bathroom with a shower. We had out stay from Sunday to Tuesday the 12-14 of June. Of course our trip away would be a cold one! When we arrived at Marble Lake Lodge we were early for check in, so we took a look around the area. They have a children's play structure (this has seen better days and even had a sign play at your own risk), lots of camping sites and a nice little beach area. They have paddle boats you can take out for a tour, They only have a few but we were lucky during our stay that no one was interested in them at the same time as us. The cottage I had believed was on the water and it wasn't. It was up on the hill not far from the beach though. I would prefer one on the beach which would be cottage #4 or #5. This way the kids can play in the sand and you can start the dinner on the BBQ or get lunch started. The cottage itself was nice enough for a cottage getaway. Nothing fancy or very modern but your to be camping and enjoying the great outdoors, right! No cell service there, well a little just enough to get a tease for who emailed me but not enough to read anything. Again we are camping and well I was on holidays. Of course it was rainy and cool as it was still the beginning of June. I was fine with it but D was almost ready to pack up after the first day. Men, eh? We enjoyed a nice camp fire the first night with s'mores, yummy. The kids loved it. We went out paddle boating, the kids were brave enough to enter the water. They played in the sand. We went to Bon Echo for a couple hours before it started to rain. They offer a pass to the park (with deposit) when you stay in the cottages or camp ground. We also watched some movies they have that can be rented free of charge. One thing I didn't like about our cottage was the bathroom was outside attached to the porch, which had windows that didn't close. With our stay being rainy and we were right on the water, it was pretty cold going to the washroom or for a shower. Plus at night it was hard for the kids to go out to the washroom if need be as we locked the entrance door. Overall though I would go back but I would go in July or beginning of August for nicer weather and I would also ask for cottage #4 or #5. This summer our family decided to do a few day trips to some more local areas and we decided Bonnechere Caves would be a neat place that the kids might enjoy. My husband, D and I decided P would love it as he is very much into rocks, caves and fun science things. A quick background to Bonnechere Caves, located in the Ottawa Valley in Eganville, Ontario. Bonnechere Caves are under a hill of limestone, the geologists have said it was a tropical sea 500 million years ago. Stalactites, or rock icicles formed at the rate of one cubic inch in 150 years, hang from the ceiling and the handiwork of nature is enhanced by electric lights. There are tons of fossils that are embedded in the limestone walls. Entombed in the rock and preserved forever can be seen fossils of coral and sea creatures alive long before the age of the Dinosaurs. Our thoughts after visiting Bonnechere Caves- I am signed up with a handful of Daily Deal sites that send out emails everyday. One day a Daily Deal coupon came for Bonnechere Caves 2 can tour the caves for the price of 1 at $16.00. We packed a lunch and snack and headed to Eganville, Ontario. When we arrived we took a quick tour of the water and bridge just outside the cave area, then headed in to pay. A was free as she is under 4. When you arrive the staff let you know when the next tour is starting, tours during the summer run every 20 minutes. We had only 10 minutes until the next tour and we were all hungry. Instead we decided to head to the picnic area and have lunch. We headed over to the tour area after having our lunch. There you meet your tour guide and hear more about the caves history and the fossils that have been found in the caves. This usually takes about 20 minutes and the tour guide asks people to guess about the fossils and adds humor to the stories. We then head into the cave where every 3 or 4 feet you stop and the tour guide gives more of the story of the cave. You can even walk through a tiny cave inside but if you are taller than 5'5 you may not want to as it is very low and I have to bend way down to go through it with P.
It is cool and damp in the cave but very interesting if you like rocks and fossils. The downside? It isn't a long tour about 45 minutes to an hour and the cost is pretty high for what you get. D and I both feel that it is a one time kind of trip. Once you see that caves it is neat but not something you would do again and again. Now that we are into August and the nights are cooler, Summer isn't gone yet! I know, I know, walking through the mall and all you see are the Fall clothes that are out, another sign school is around the corner and with that comes Fall. We still have a couple more weeks of summer to go! Why not enjoy them with camping, picnicking, swimming and being outdoors? We plan on doing just that. We still have a couple more weekends to enjoy our swimming and camping and Coleman has the right equipment that we will need for that time. Want a place to chat with Coleman about their products? Join Coleman Canada's Facebook page and start talking. It is a great place to also talk about camping with other campers and swimmers. We love hearing about all the Coleman news there also! Have you ever been camping and wanted to grab something out of the cooler at night. It's all about remember what the item feels like. Coleman has made seeing in the cooler at night so much easier with the Auto-on Cooler Light. 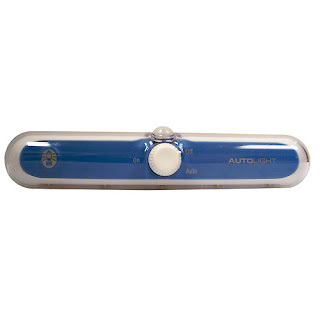 This little light is powered by three AAA batteries and uses 37 Lumens to light up your space. It doesn't just need to be a cooler, it can be a tool box or a closet, any small dark space you may want a light with an automatic sensor. 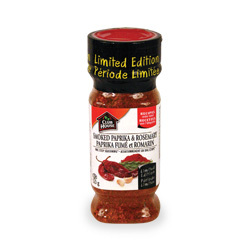 You can find these at Zellers, Sears and Canadian Tire $19.99 on sale this week at CT $13.99! 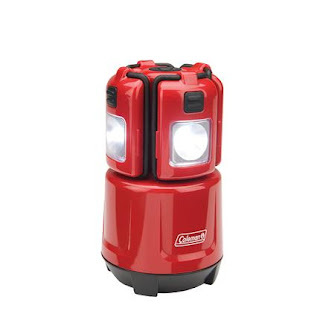 Another way Coleman can help light up the night is with their Mini Quad Lantern. This little light is very mighty! I love it. I also love the fact that the lights can be removed for "single" lights in case someone needs to move away from the group or you just want to carry a small light that is still very bright. This lantern features four little "pods" that are removable. The lantern can light up your night for 25 hours. Each pod lights for 12 hours. Please check out my review and how we enjoy it. Available at Canadian Tire $39.99. My favourite summer item this year has been the Stearn Puddle Jumpers! They have been just what my kids needed to overcome that swimming fear and also put my mind at ease when the kids are swimming. Check out my past review on how my children and I LOVE theirs. Puddle jumpers are for children 30-50lbs and are great to help children keep their upper body higher in the water. Available at Canadian Tire $29.99. Tell me one of your favourite camping memories, this can be from when you were a child or a more recent memory. Please include you email address or twitter handle. Please read How to Enter if you are new to Canadian Coupon Mom. Each one is worth one entry each (one comment is an entry) unless otherwise marked. This giveaway is open to Canadian Residents and ends on August 25th, 2011. One winner will be chosen August 26th,2011 using random.org. The winner will have 48 hours to respond to the winning email with their mailing information. Thanks and Good Luck!! A great way to get the kids unplugged is by getting the family together and having a game night. I have a lot of board games I love to play. I would say I love brain teasers the best for sure! My husband is pretty good at spelling, word type games so it can sometimes be unfair but I still love playing games with him. Bananagrams is a exciting and fun word/anagram game. It reminds me of a scrabble type of game. This is an anagram game that will drive you bananas! The players race against each other to make a crossword grid and use all their letter tiles first. This game can be played alone or with many people playing along side each other. It can also be played while waiting at a restaurant or anywhere that you can use a table top. A great game to get the kids thinking about words and not about what they are waiting for. 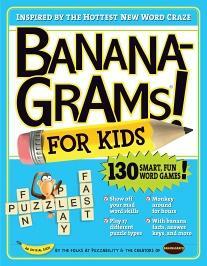 Workman Publishing publishes the Bananagrams books for on the go or just fun on paper. They also offer Calendars for more anagram fun! The recommended age for Bananagrams is 7-97 years old. This is a great game for anyone who likes word teasers, crosswords or spelling. Our friends at Thomas Allen & Son has sent us our vary own Bananagrams and a Bananagrams workbook. I have "played" Bananagrams with my children, instead our game is all about making words together and learning how to spell. They are almost 4 and 5 years old. I have played Bananagrams a few times myself and I plan to challenge my husband to play with me soon enough. I can see this being a game that my children will love to play over and over again as they age.They already love just pulling out the tiles and spelling simple words they know. Buy it: You can buy the Bananagrams for Kids book on Chapters or Amazon. You can also pick up the Bananagrams game on Bananagrams.com. Win: Thomas Allen & Son would like to offer Ten (10) lucky Canadian Coupon Mom readers their very own Bananagrams set. This set includes the Bananagrams Game in a banana pouch with 144 letter tiles, and also a Bananagrams for Kids book! Mandatory Entry: Please tell who you would like to play Bananagrams with or would you give this as a gift? Please include your email address or twitter handle so you can be contacted if you win. Also please do the mandatory entry first before any the extra entries will count. Thanks! Extra Entries: Each one is to be left as a separate comment and is worth one entry/comment each. Like Thomas Allen & Son on Facebook and "like" the Banangrams picture in their album. This giveaway is open to Canadian residents and will end August 29th at 11pm EST. One winner will be chosen by Random.org and notified August 30th, 2011. The winner will have 48hrs to respond to the email with their information. Good Luck!